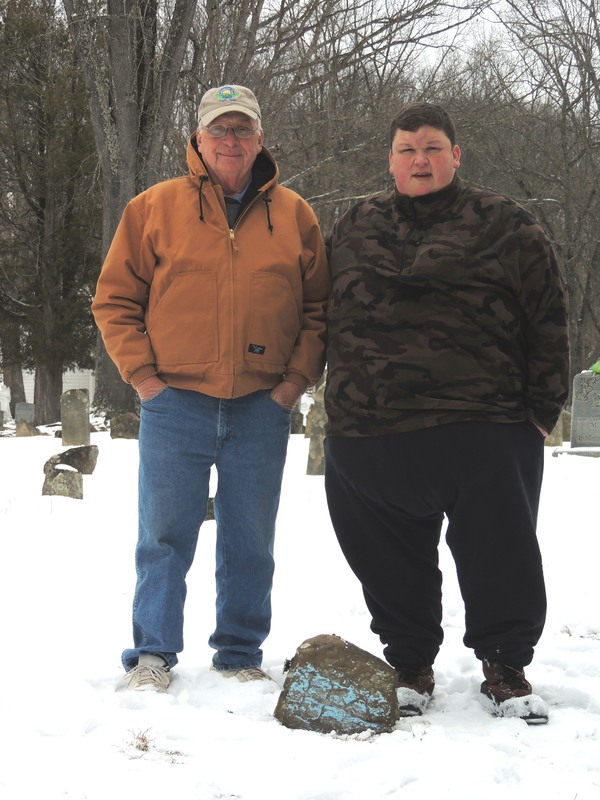 Two weeks ago, after ten years of intense searching, and checking hundreds of Wayne County cemeteries, Robert (Bobby) Maynard and his father, Ronald (Ron) Maynard, members of The Wayne County Genealogical and Historical Society, located the grave of James Maynard in the Queens Ridge Cemetery. Robert said that he actually laid down on the ground to make sure this was the grave of his Maynard ancestor. He then applied chalk to bring out the hidden images on the field stone. He discovered the initials J. M. first. Then he could identify the numbers 175__. It was then that he realized that the zero was the missing number. Genealogical records indicate that James Maynard was born around 1750. 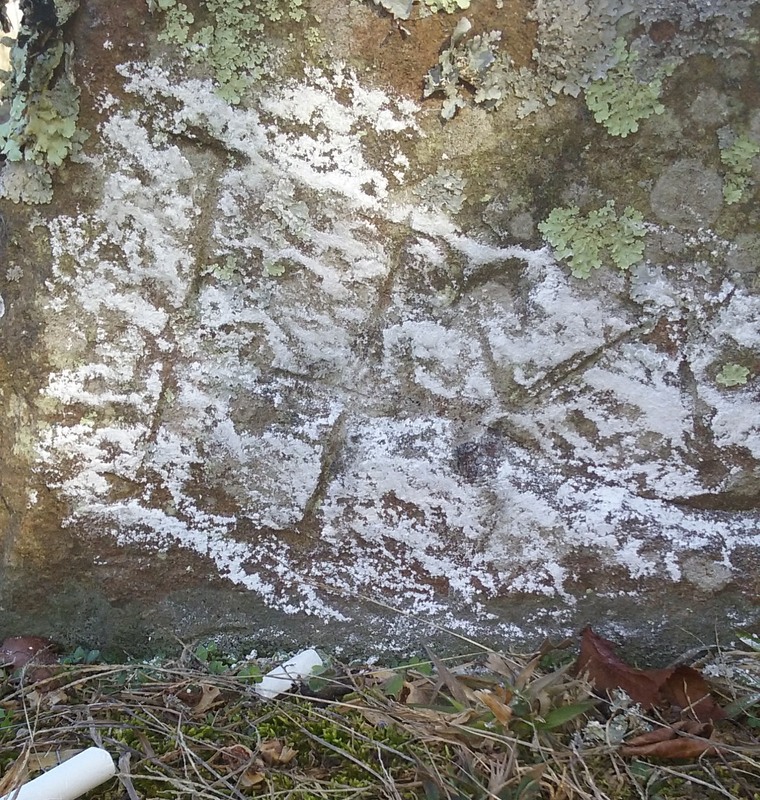 From the location on the crown of the hill, and the closeness of his son, Jesse Maynard, with whom James was staying in the 1850 census of Wayne County, VA/WV, another clue was found. This cemetery has had excellent care over the years, and it contains many field stones. Several of these field stones still have readable images after so many years. There are hundreds, possibly thousands, of descendants of James Maynard still living. The Queens Ridge Cemetery is located on property which is nearly surrounded by the property of Penn Coal Corporation, and it can be reached by following the Coal Haul Road from the Cabwaylingo Park Road near Missouri Branch, Wayne County, WV. 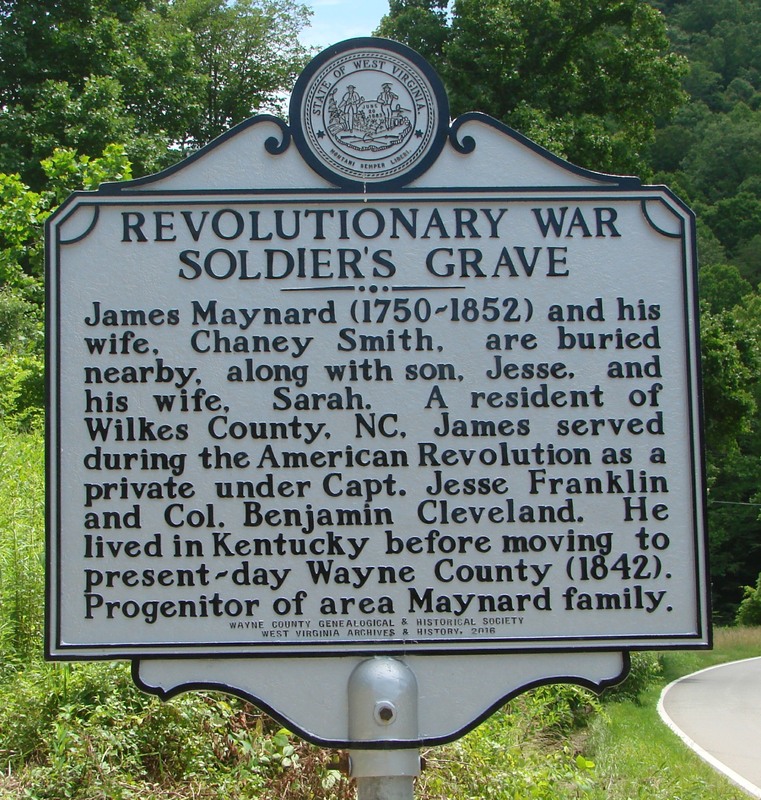 James Maynard, the Revolutionary War Soldier, was born in Virginia in 1750, moved to Wilkes County, N. C., served in the Revolutionary War there, and moved to Kentucky around 1816. 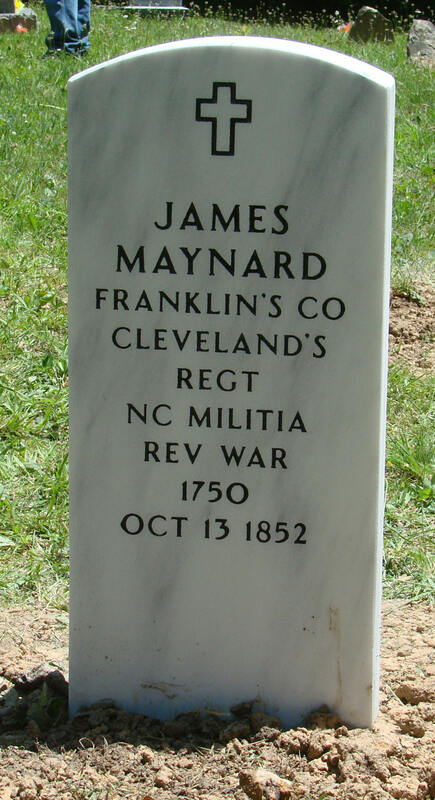 He was listed as a member in the "Roaring River Baptist Church," in the late 1780’s and 1790’s prior to moving to Floyd County, Ky.
James Maynard , a resident of Wilkes Co. N.C. enlisted for six months as a private under Captain Jesse Franklin and Colonel Benjamin Cleveland. He moved from Wilkes Co. N.C. to Floyd County, KY, and from there to Pike County, KY. He was granted a pension on Sept 1, 1832, as a citizen of Pike Co. KY. In 1841 he was living in Cabell Co. VA (that part of Cabell which became Wayne Co. in 1842). He died Oct 13, 1852, in Wayne County, VA/WV, and the location of his grave became unknown until discovered by Robert and Ronnie Maynard. The widow of James Maynard, Chaney Smith, whom he married Dec. 25, 1801 in Wilkes County, NC, was allowed a pension in her application on February 28, 1857, at which time she was seventy seven years of age and living in Wayne County, VA/WV. Chaney died several years later, and is believed to be buried near her husband, James. Also known to be buried in this cemetery is James’ son, Jesse Maynard and his wife Sarah (Welch) Maynard. James was living in the Jesse Maynard household at the time of his death. Words cannot express the gratitude that the Wayne County Genealogical & Historical Society has for the two Maynard descendants who found the grave of their Revolutionary War Ancestor. Plans are now being made to provide a suitable stone for both James Maynard and his wife, Chaney Smith Maynard. We believe the Veterans Administration will furnish a Rev. War Marker for James. We are now pursuing the filing of such application. Fund raising has also begun to provide a Revolutionary War Roadside Marker for James Maynard. These signs are procured through application to the State Government, and cost about $1,800.00 each. All donations should be made by making your check payable to WCGHS, then mail it to WCGHS, P.O. Box 787, Wayne, WV 25570. On Thursday, February 25, The Wayne County Genealogical and Historical Society forwarded an application to the Veterans Administration for a grave marker for James Maynard. Along with the application, numerous other files concerning documentation for the application were sent. It is our hope that the application will be approved in the near future, so that we may get the grave marked. If approved, these markers are provided free of charge. We will keep this site updated with any progress. The Wayne County Genealogical And Historical society has obtained an application for a raodside marker to commemorate Rev. War Soldier James Maynard. This application will soon be completed and forwarded to the West Virginia Department of Archives and History, who are responsible for having these markers made. After the application has been approved, they will order the construction of the marker. When it is ready for delivery, we will need to make full payment for it. I am informed that the current price for these markers is approximately $1975.00. The marker will need to be set on the Department of Highways right-of-way. The location will need to be decided. In the meantime, we must get serious about raising this amount of money to honor James Maynard. Donations will be made to the Wayne County Genealogical and Historical Society. (WCGHS) Make your checks payable to WCGHS and mail to WCGHS, P.O. Box 787, Wayne, WV 25570. Your donations will be greatly appreciated. While WCGHS is sponsoring this monument, we are not capable of paying for it, so all who are interested in having this memorial erected to honor James Maynard, must join in and support this project. We are proud to announce that we have reached our fundraising goal for the James Maynard Roadside Marker. The application has been submitted to the West Virginia Department of Archives & History. They have informed us that it will be between three and four months for the completion and setting of the marker. We will be posting updates on the process and when we will plan a dedication ceremony for the marker. The Wayne County Genealogical & Historical Society wishes to thank all who have participated in this process. 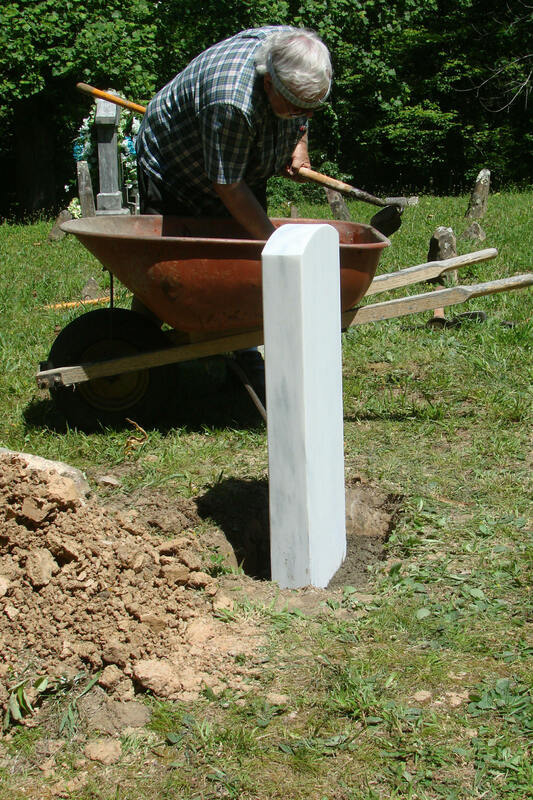 Today, the grave marker for James Maynard arrived at the Morris Funeral Home in Wayne, West Virginia. The marker will remain at that location until we are prepared to set it. Plans are underway now for the setting of the marker, and will be posted here as soon as they are complete. At our monthly meeting in May, it was decided to forego our regular June (June 18, 2016) meeting in Kenova. Instead, we will meet at or near the Church at the Queen’s Ridge Cemetery. Please bring your own lunch, as no food is available in that area. We will have our meeting and lunch and afterward we will erect the monument on the grave of Rev. War Soldier James Maynard. The monument has arrived and is in custody of the Morris Funeral Home. In case of bad weather, the installation will be the following Saturday. Please join us in this historical event. James Maynard was born in 1750 and died in 1852, so this is indeed a one-time event. If you wish, bring along some friends. From State Route 152, turn left toward Cabwaylingo State Park. Continue to the first blacktop road which turns left. (The Coal Haul Road) Follow this road to the Cemetery. 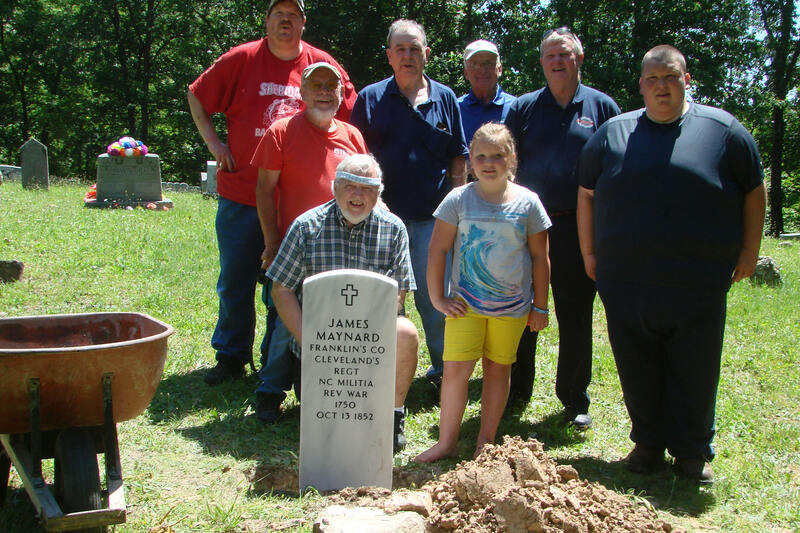 On June 18, 2016 the installation of the magnificent marker for James Maynard, which was supplied by the Department of Veterans Affairs, was completed. There were 33 people who attended this event. Below are some photos of the day. The James Maynard Highway Marker Has Been Erected. The Department of Highways has erected the Highway Marker for Rev. War Soldier James Maynard. It was erected the first week in June. The marker is located about one mile south of Dunlow, on the road to Cabwaylingo State Park. It is at the mouth of the "Coal Haul Road". The Wayne County Genealogical & Historical Society is planning an unveiling ceremony at 1 PM on Saturday, August 12 of this year. The ceremony will be held at The Dunlow Community Center. After the ceremony, we will proceed to the site of the marker for the unveiling. A convoy will then proceed to The Queens Ridge Cemetery, where James Maynard is buried. This cemetery is about ten miles from the site of the marker.